Halloween candy... you either love it or you don't! 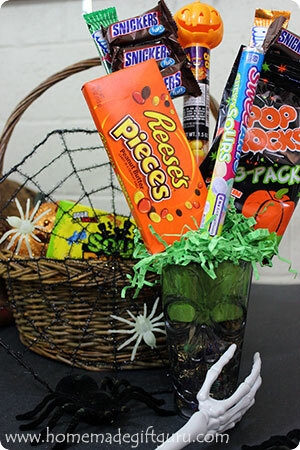 Well, if you love Halloween candy and you want to use it to make some great homemade Halloween gifts, then please read on. 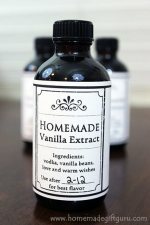 The following Halloween candy ideas make great homemade teacher gifts and gifts for friends, as well as fun Halloween party favors and more. Part of what makes these Halloween candy ideas so simple, is the free printables. ...If you have access to a printer, you can simply print the coordinating Halloween gift tags and attach them for easy added cuteness. 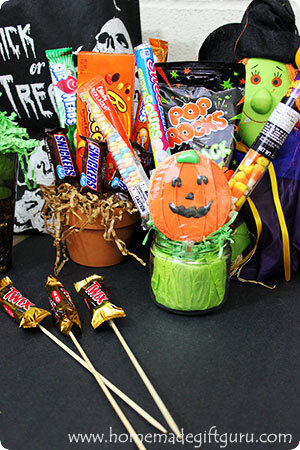 Some of my favorite Halloween candy ideas include Peeps in a jar, Halloween candy bouquets and crazy candy people. I buy a lot of my candy from the bulk section in my local supermarket. You can also get good deals buying candy in bulk sizes online or simply wait for your supermarket's sales. 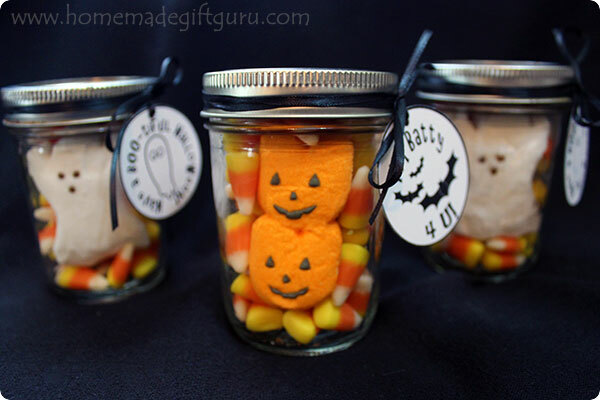 Creating these little jars full of Halloween spirit is simple, especially with the free Halloween printables included. Wash jars and lids with warm soapy water. Rinse well and dry thoroughly. Sprinkle one layer of candy inside each jar. Position a Halloween-themed marshmallow peep inside each jar. 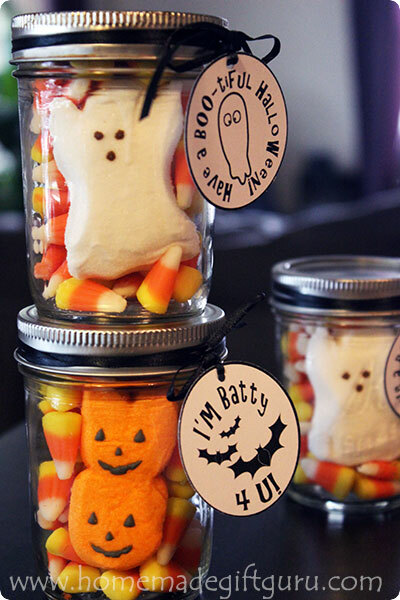 Fill the rest of the jar with Halloween candy. Attach gift tags with ribbon. These are a lot of fun. You can also do this with regular peeps for Easter, see here. 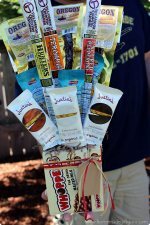 Candy arrangements and candy bouquets make adorable homemade gifts. You'll have a ton of freedom, choosing a cute container and all the fun coordinating candy to go inside. For more detailed instructions, visit my main page on how to make candy bouquets. Insert floral foam into container. Glue it in place if needed. You can wrap the foam with tissue paper if it looks better. You can also cover the top with paper shred for more visual appeal. Attach candy to wooden skewers using clear packing tape. Make sure the skewers are the best length for visual appeal. 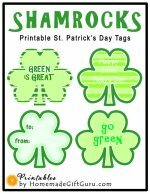 They can be cut with pliers or heavy duty scissors. Insert the skewers into the floral foam like you are creating a flower bouquet but with candy. I like to start from the back and work my way to the front. Once your candy arrangement looks great, attach a gift tag and it's ready to give! It's so much fun making these crazy candy people! 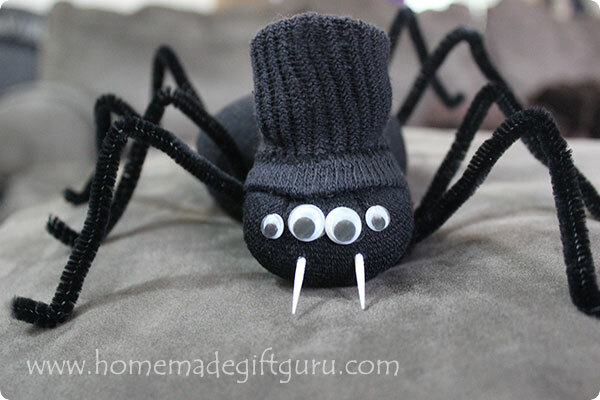 The kids will enjoy the simple creativity and the funny outcome. 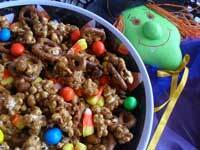 Crazy candy people make cute homemade Halloween gifts and they can be given out at school or in your neighborhood. There are various ways to make these little guys and gals, depending on the candy you buy, but I'll walk you through the basics below. Head: Pumpkin suckers or other suckers that can be made to look like a crazy candy head. Body: Any package of candy that would look good for the body. Fun size M&Ms works well or fun sized dots, nerds or various candy bars. Arms and Legs: Long skinny candy such as Individually wrapped twizzlers, smarties or tootsie rolls. Play with and pick out the perfect candy for the head, body, arms and legs of your Halloween candy person. You can either hot glue all the candy together or tape it using clear packaging tape. Have you ever wanted to give pumpkin poop or ghost poop? Well now you can! To make pumpkin poop, put together a clear package of cheese puff balls and write on it, Pumpkin Poop. To make ghost poop, put together a clear package of marshmallows and write on it, Ghost Poop. Along the lines of Pumpkin Poop and Ghost Poop is Witch Warts, Jack-o-Lantern Teeth and Monster Scabs. To make Witch Warts, put together a clear package of chocolate covered raisins or plain raisins and label them Witch Warts. To make Jack-o-Lantern teeth, put together a clear package of candy corn and label them Jack-o-Lantern Teeth. To make Monster Scabs, put together a clear package of square cereal such as Chex, Cinnamon Toast Crunch or Life and label it Monster Scabs. You can also mix and match any of these ideas such as "Witches Warts and Monster Scabs"
That's it for now. 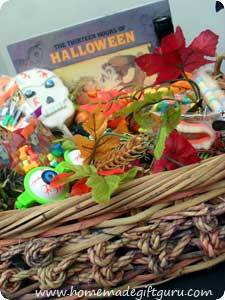 Be sure and check out these Halloween gift basket ideas for more fun and easy homemade Halloween ideas.